I still don’t particularly like to do vintage, but I have one more block to use before I’m finished the Mary Kerr’s Vintage Revisited Challenge. Each block is more “challenging” than the one before it and this one…well, this one’s a real doozy! In this case, I think there are real and compelling reasons why this quilt was never finished. What should I do for this sixth and final quilt in the challenge? That begs a bigger question: where does the inspiration come from? Sometimes a quilt challenge will immediately inspire ideas. The colors, the subject matter, the size of the materials or the textures — something will spark an idea that can be fanned into a concept, a sketch, a plan. Um, not this one. I’m a word person, and so sometimes I rely on words to lead me to a visual idea. “Grandma’s Flower Garden” did nothing for me, although my grandmother did have lots of flowers on her farm. 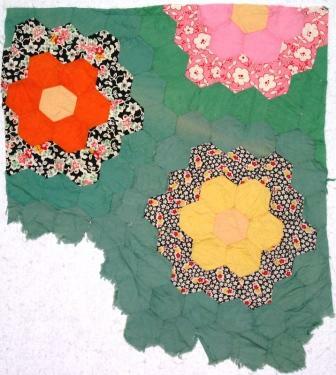 I’m not really a floral quilt person. 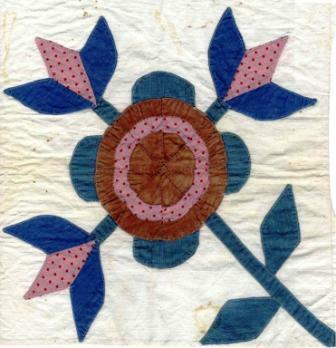 For this challenge, three of the quilts are sort of in a series with letters, correspondence, and old-fashioned pens being the common thread. This block didn’t seem to fit with that either. Three of the quilts also have metal embellishments, but that seemed sort of out of place with this block. As a final resort, I looked through my design journal and photographs looking for inspiration. 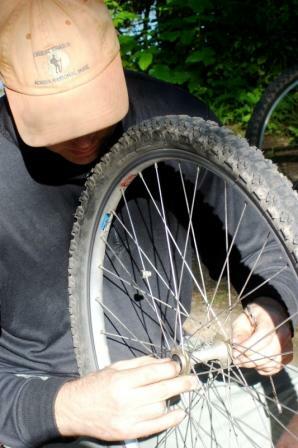 And there it was: a picture of my husband on a Boy Scout bicycle trip (as a volunteer, not a Scout) fiddling with his front tire. I’m not sure what it is about this photo that so captivates me, but there it is. I think the orange hat, the greenery in the background, the preponderance of rounded shapes all connect this image to that poor, tattered quilt fragment. The real challenge here is to see if I can find a way to make those sad little hexagons resemble the photo of my husband. I reserve the right to change my mind if (1) this doesn’t work, (2) I find a better idea, or (3) time requires that I take a more expedient route. Stay tuned for progress reports. And I’d love to have your ideas and comments. 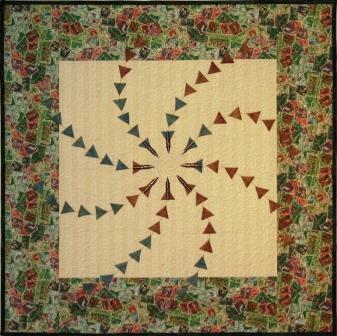 To see the first five of my Vintage Revisited quilts, check out my website homepage: www.MoonlightingQuilts.com. For more information about the Vintage Revisited Challenge, including its travel schedule, visit www.MaryWKerr.com.